The T-55 has long been one of the most wanted models in 1/72nd scale. 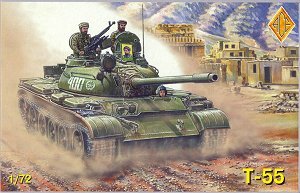 ARMO was first on the scene with a resin kit of the T-55A, but many people will not work with resin, and their distribution is not as widespread as most plastic kits either. 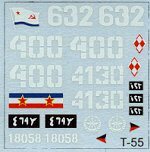 Both ACE and PST almost simultaneously announced forthcoming T-55 kits in plastic, with the ACE kit appearing first. This first of the plastic T-55's represents a "base model" of the T-55 tank, i.e., NOT a T-55A, T-55M, or other variant of the tank. The main distinguishing characteristics of this version are the lack of cupola for the loader, and no 12.7mm AA machinegun. From what I understand, later modifications to the existing T-55's often added the machinegun, but none is included with this kit, despite what is depicted on the box top. This is a "limited-run" model, a fact which many people tend to forget when looking at ACE's latest releases. Their 2S1 and MT-LB in particular, are so fine, that it's easy to overlook the fact that these kits are not made with the same expensive technology as Hasegawa and/or Revell. This new T-55 is not quite as well-made as the MT-LB/2S1 kits, and it more closely resembles earlier ACE kits, such as their BRDM-2's. Even so, I still think that ACE makes some of the best limited-run kits today. Yes, they take a little more effort to build, but the quality of the master parts is obviously very high, so that the final model looks great. The main turret sprue includes parts for the upcoming OT-55 kit, which will likely be exactly the same as this kit, with different marking options. The quality of the turret and hull sprues is very good. There is some flash, and a couple of the parts are molded a little heavy, but nothing that is unusable. 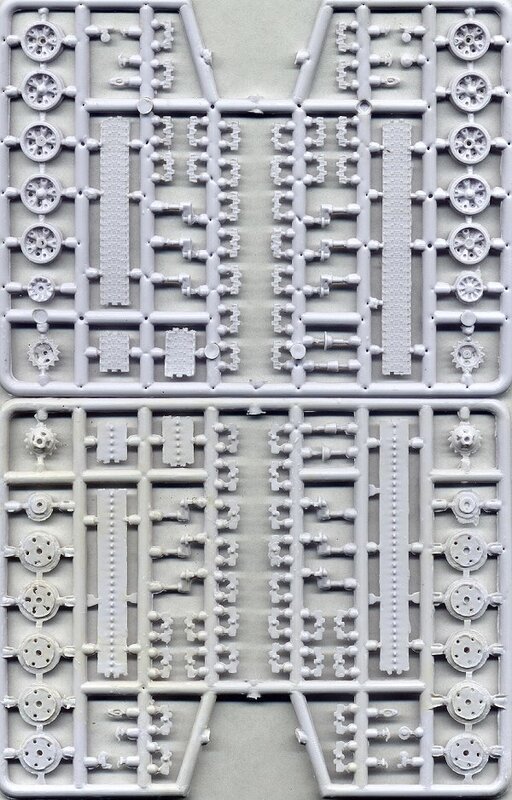 The wheel and track sprues are more rough, with very heavy flash, and muted detail. 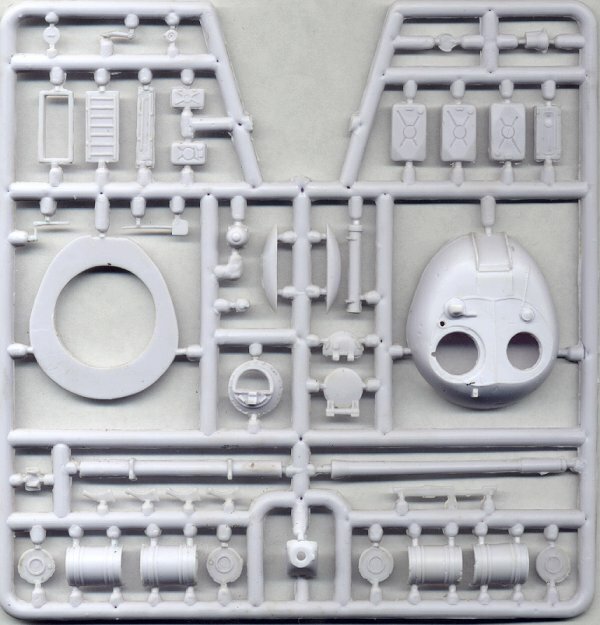 ACE has since re-molded this sprue, and all future T-55 (and T-54) kits will include better track and wheel components. The tracks have fine surface detail on the outsides of the track runs, but the inner surfaces are smooth, with the exception of very prominent and nicely-shaped guide teeth. There are several pieces of various length track, as well as a great many individual links. Many of the links are malformed, but there are almost twice as many links included as is needed, so feel free to discard the poor links. Markings are included for five different vehicles: one Yugoslavian (mid-90's), one Polish (invasion of Czechoslovakia), one Afghanistan Northern Alliance, one Soviet Naval Infantry, and one Iraqi (Kuwait, 1991). The decals are very thin and very well printed.